Wanting your body to be toned and contoured is normal. And that goes for everybody. Some people tend to get the notion that only women are interested in having their bodies in tip-top shape. That, of course, is completely untrue. 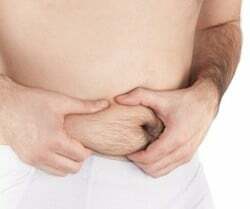 Men may not like to admit it as much, but they too experience problems with dreaded “stubborn fat”. Just like women, men can get love handles – and they don’t love them either. CoolSculpting for Men is a great way to reduce fat with no surgery or downtime. CoolSculpting for men therefore, has become an amazing treatment for men who wish to have more toned mid-sections. Sure, they could try doing crunches every day. But that won’t necessarily do much in the way of getting rid of their aptly-named “stubborn fat”. Sometimes, diet and exercise just isn’t enough. And so freezing away fat cells has become a wonderful new solution. But does it actually work for men? Perhaps, it would be best to take it from one man who took to YouTube to explain his concerns about the fat that he felt was plaguing his shape. His problem area was located right below his belly button. Grabbing the fat in that area, the gentleman explains that he has “done well” toning his upper mid-section, but needed some extra help in his lower stomach. details the several following weeks as he goes through each of his CoolSculpting treatments. Following his appointments, the man throws on his video camera to document the loss of his “stubborn fat”. He admits to being skeptical, however. After five days, he can still see that “bump” that he doesn’t like. Is he really losing any fat? Right at the three week mark, the man still feels as if maybe the procedure isn’t working out for him. But after three more weeks, he admits that he has lost a “good amount of fat” even though he admits being told that it often takes up to eight weeks to get full results. After eight weeks, “I can see a noticeable different,” he says. Showing his audience his side profile, it is clear that CoolSculpting for men has diminished his hated “bump”. If nothing else, the video proves that CoolSculpting for men provides results – even if they take longer for some patients than others. The key, of course, is to know that with this procedure, your body will naturally ridding itself of frozen fat cells. There will be no need to cut or inject anything into your body. This makes CoolSculpting the safest possible treatment to reduce fat. For men seeking a way to reduce fat, CoolSculpting for men is definitely worth looking into. There’s no question that it gets harder to stay fit the older we get. In the comments section of the aforementioned video, the gentleman posting under the name “OrlandyGuy32801” admits, “I try to keep it together but it does get harder as I get older.” Are you finding that you have the same problem? Well, join the club. It is not at all uncommon to have greater difficulty keeping the fat off as you get older. Yes, healthy eating and exercise will always be recommended. But if you’re like the many others who need a little bit of extra help ridding yourself of stubborn fat, it’s time to consult a physician about CoolSculpting. For more information, fill out our consultation form or call DermMedica toll free at 1-866-861-3070, or if you are in Kelowna, call 250-868-3070.